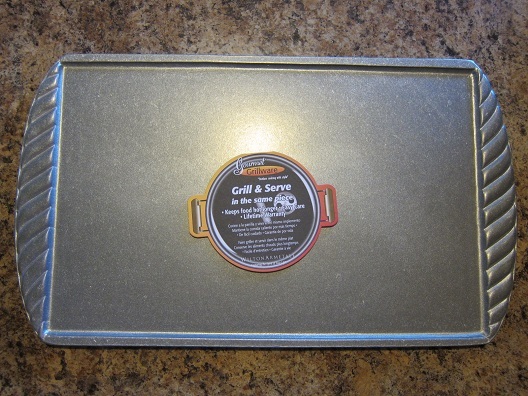 For this week’s review I was sent the Grillware Griddle from Jes Wagner at Wilton Armetale. 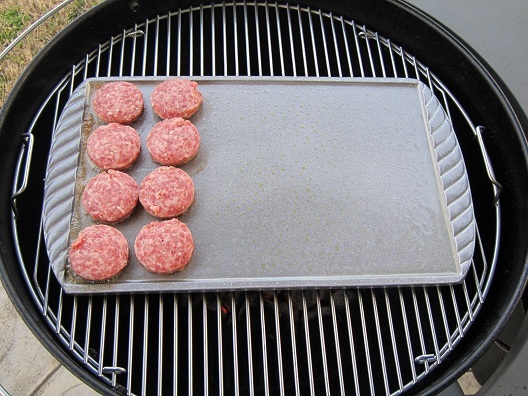 The Grillware Griddle is a griddle that can be used on your grill, stove top and in the oven. It’s crafted from a non-toxic aluminum-based alloy metal that is very durable and will not rust, break, crack or chip under normal usage. It’s also safe for grilling and cooking food up to 1,000 degrees. I have been looking for a product for a while now that I could use to cook breakfast on my grill with so when I was given the opportunity to do a review on the Grillware Griddle I knew I had to grill up a nice big breakfast on it. The morning of my review I got up early and was ready to cook my family a big breakfast, unfortunately it was really windy and rainy out so I decided to wait and see if the storm would pass. It ended up raining most of the day until dinner time rolled around. 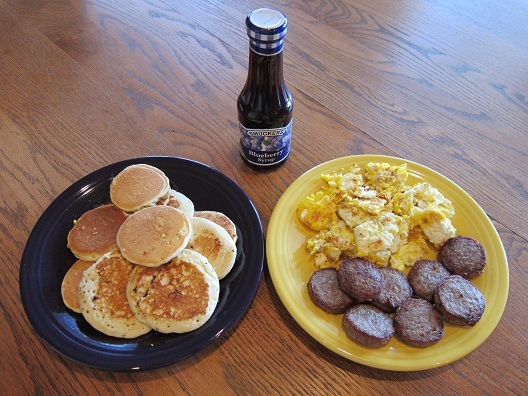 I’m a big fan of breakfast for dinner, so that evening I got all the food together and fired up my grill. 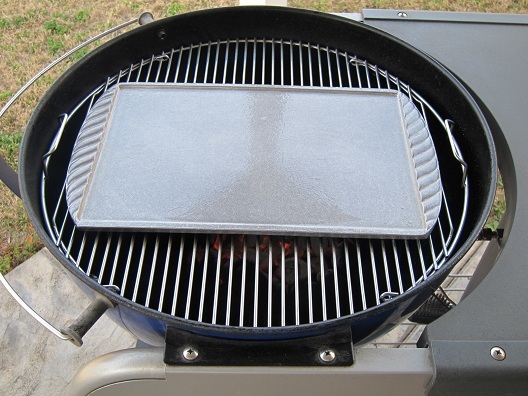 Once the grill was ready I sprayed the Grillware Griddle with some Pam Grilling spray and placed it on the grill. Then after I let the Grillware Griddle heat up a little, it was time to start cooking. 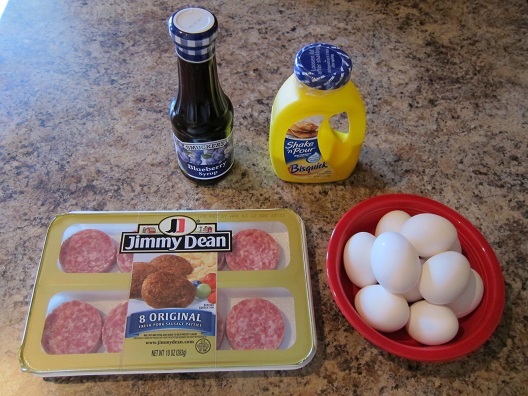 First thing I put on was some Jimmy Dean Sausage. After I flipped the sausage it was time to cook some pancakes and scrambled eggs. Once everything was done cooking on the Grillware Griddle, it was time to chow down! The Grillware Griddle was a really fun way to cook a nice big breakfast. As you can see in the pictures above, it can hold quite a bit of food. It also makes for a nice solid cooking surface so you don’t have to worry about food slipping through the grates. Grillware Griddle’s are very easy to clean with mild soap and hot water and won’t rust or tarnish. They also come with a Lifetime Warranty. 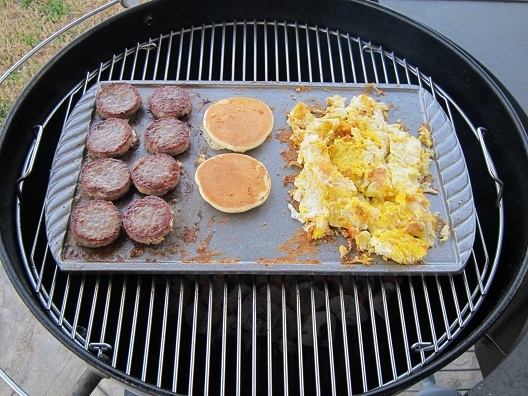 Another great thing about the Grillware Griddle is that it can be used to keep cold foods cold. Lets say you want to use it for a cheese platter, you put all your cheese on it and keep it in the fridge till its time to serve. The Grillware Griddle is also great for keeping hot food hot longer, so after you’re done cooking, you can bring the griddle right to the table for serving and keep the food hot at the table long after it’s removed from the grill. As with anything hot you remove from your grill, make sure to use something to protect your hands when you remove the Grillware Griddle and also use a trivet to protect the table surface. I am very happy with the Grillware Griddle and I know that as long as I take care of it, I will get many years of great use out of it. You can find a great deal on the Grillware Griddle here . For more information on the Grillware Griddle please visit their Facebook page as well as their Website. Make sure to check back soon for another great BBQ Tools & Tech Review! Great Review Jay! looks like another accessory I need to add to my collection. I enjoy making breakfast and the Grillware Griddle would be a great tool to be able to use on a tailgate or just for a Sunday morning BBQ fix. Thanks Mike! I am glad you liked my review! It’s definitely a cool BBQ tool to have. I think I’m going to cook some french toast and bacon on it next! Thanks for leaving a comment Mike! Thanks John! I am really happy with mine and at $32.99 with free shipping on Amazon, it’s a great price for a really quality made product! Plus it comes with a Lifetime Warranty. Thanks for leaving a comment John! Jay, great review. You are killing me though, thought this grilling thing would be a low cost hobby. Now I have to buy yet another thing you’ve reviewed….. Thanks Rob! lol yep its not a cheap hobby at all, but you can’t help but buy cool BBQ products like this! Thanks for leaving a comment man!